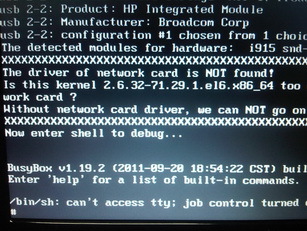 which is located in the  DriverInstall directory. Do you want proceed? (y/N) yIMPORTANT INFORMATION! [[email protected] DriverInstall]# /opt/drbl/sbin/mknic-nbi --modules "sk98lin"
Kernel 2.6 or 3 was found, so default to use initramfs. Use kernel modules from /tftpboot/node_root//lib/modules/2.6.32-71.29.1.el6.x86_64. This entry was posted on Thursday, October 13th, 2011 at 16:30 and is filed under centOS, Linux. You can follow any responses to this entry through the RSS 2.0 feed. You can leave a response, or trackback from your own site. Hola !. Algun tutorial para instalar clonezilla en centos 6.3 ?. logre la instalación pero el equipo cliente tiene error tftp al inicio. cual es el error ?. Can you capture a error log? Gracias !. desabilite SELinux y todo funciona.